The Muskegon Lumberjacks remain the top team in the USHL, and two of their leaders have been recognized for another strong week of performances on the ice. Forward Egor Afanasyev and defenseman Alex Yakovenko have been named the junior league’s players of the week for their respective positions, the USHL announced today. 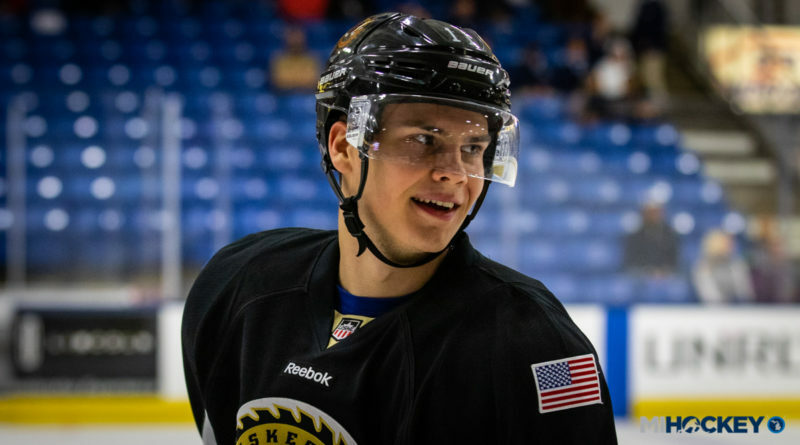 Afanasyev, a Michigan State commit and Little Caesars alum, recorded seven points in the three games he played this past week, improving his total to 24 on the season (through 16 games). Yakovenko, in the same time frame, recorded five points and a +2 rating to lead the Jacks on the blue line. Last week, the Lumberjacks beat the NTDP Under-17 Team 8-0 on Wednesday, then they topped the Green Bay Gamblers 8-3 on Friday. Despite a 6-3 loss to the Gamblers the next night, the ‘Jacks still hold a six-point lead for the top spot in the Eastern Conference with three games in hand of second-place Central Illinois. Muskegon’s 20 points have them one spot above the Tri-City Storm, the top team in the Western Conference, as well.